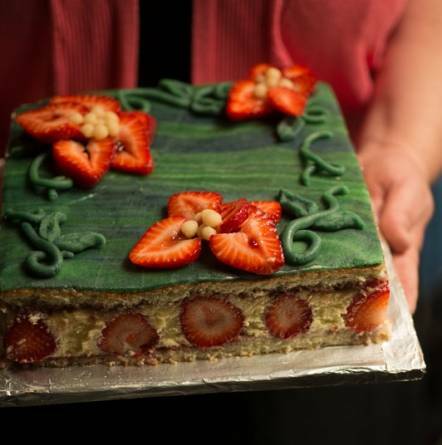 Sugar Nymph&apos;s Ki Holtze whipped up a show-stopping version of fraisier, a French cake named for les fraises or strawberries, that decorate it. It includes pastry cream and sweetened almond paste or marzipan as a part of the layered confection. You may choose to leave out the food coloring from the marzipan and have a cream-colored cake, but there’s something extra festive about the look of the dyed topping. 1. Position oven rack in center of oven and preheat to 350°. 2. Butter 9-inch square pan with 2-inch-high sides. Line bottom with parchment paper. Butter and flour parchment. 3. Using electric mixer, beat eggs and ⅓ cup sugar on high speed in large bowl until a slowly dissolving ribbon forms when beaters are lifted, about 4 minutes. Mix nuts, flour, cornstarch and baking powder in medium bowl. Fold nut mixture into egg mixture. Using clean beaters, beat egg whites in medium bowl until soft peaks form. Gradually add remaining 2 tablespoons sugar and beat until stiff peaks form. Fold whites into batter in 2 additions. Transfer batter to prepared pan. 4. Bake until toothpick inserted in center comes out clean, about 18 minutes. Cool cake in pan on baking rack 5 minutes. Cut around cake in pan. Turn cake out onto rack. Peel off parchment; cool cake completely. time, beating after each addition until just blended. 3. Melt jam in heavy small saucepan over medium heat. Stir remaining 4 tablespoons brandy into jam. Cut cake horizontally into 2 even layers. Place 1 layer on 8-inch cardboard square. Brush half of jam over. Spread 1 cup buttercream over jam. Cover buttercream layer completely with whole strawberries, stem end down. Set aside ½ cup buttercream; spoon remaining buttercream over, between, and around berries. 5. Knead marzipan and 2 drops green coloring in large bowl until color is evenly distributed. Add another drop or two, if you wish, for a deeper shade. Dust work surface with confectioners’ sugar. Roll out marzipan on sugar to 12-inch-diameter circle, sprinkling with confectioners’ sugar as needed, to prevent sticking. Spread reserved ½ cup buttercream over top of cake. Using rolling pin as aid, drape marzipan over top of cake. Press gently to adhere. Trim marzipan flush with top of cake; reserve trimmings. Brush excess confectioners’ sugar off marzipan. Using long sharp knife, cut ⅓ inch off each side of dessert to expose strawberries. Cut marzipan trimmings into leaf shapes using small cutter.